I scream, you scream. . .
I’ve got a few things to tell you about before the ice cream. . .but it’s worth the wait. I bought a different brand of melatonin, and it for whatever reason, I couldn’t sleep. For a week. I’m finally taking the correct brand, and I’ll sleep like a big kitty now. (Until I have to buy more.) That’s why I’m late writing this–I’ve been half-awake and half-asleep all week. Ugh. Don’t panic–Jezebel and all the other kitties are safe. I found this on Facebook, (HuffPo also has a short article) and it’s just too cute not to pass on. 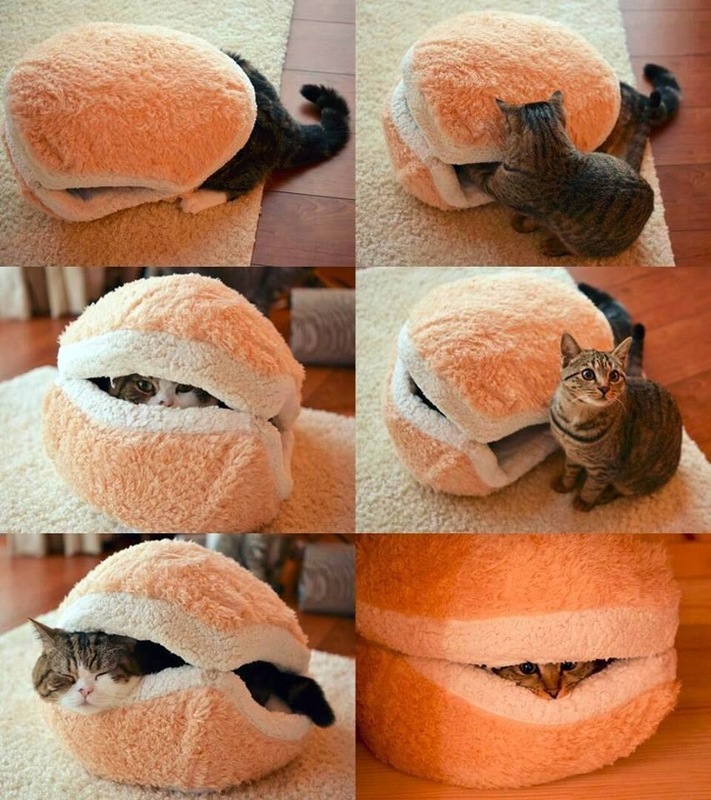 Cat sandwich. Perfectly normal, right? Hope I didn’t scare anybody! I might try to make one of these one day, or at least buy one. I think it’s cute. They’re sold by Amazon Japan, but right now are out of stock. I only found one book on sewing cat beds on the American Amazon site, but it’s a Kindle book. I guess sewing cat beds aren’t the hot thing just yet. Jezebel’s bed needs a softer cover–she doesn’t like the heavy duck I used, so one day I’ll get a yard of something soft and furry to cover it with. Ok, no more sewing news. The HeatCageKitchen garden is doing great, despite the weeds, which is one of my to-do projects for the 3-day 4th of July weekend. In addition to weird little frankenberries in the hanging basket, there is a thicket of lettuce growing in one of the pots, and will soon be teamed with a couple of beautiful gifted tomatoes from the GER’s garden soon for a. . .salad. 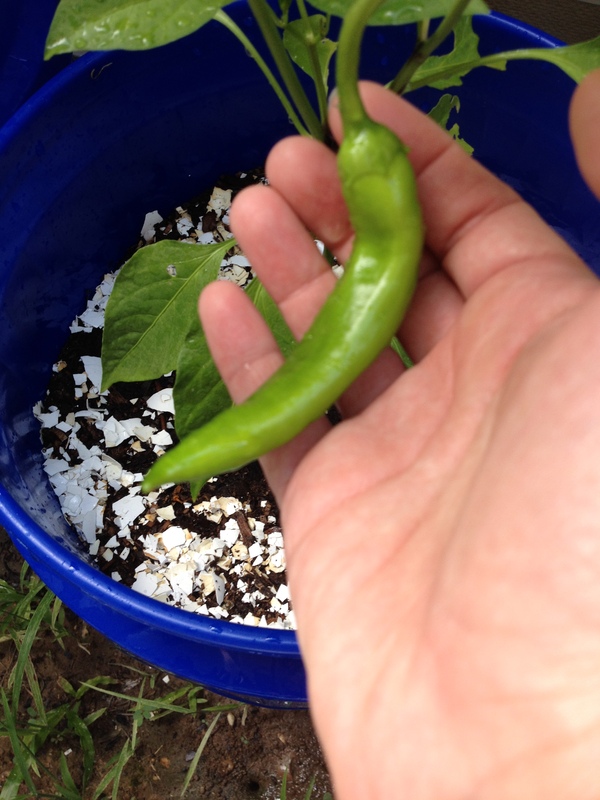 There is also one Anaheim chili pepper growing, and it seems to double in size overnight. There will be more coming later, but for now, it’s my first. Anaheim chili pepper. You’ve seen these, right? What do you DO with this? Well. . .you’ve probably seen them in your local grocery store, but the only recipe I have for them is a grapefruit salsa, which I’ve been making for 20 years. I love it. I’ll post that recipe when I make it, so you can see it. I make it when I take those grapefruit off my Buddhist altar, if I don’t just eat them outright or make something else with them. No tomato flowers yet, but I hope to see them soon. That plant survived an unusually harsh and long winter, but it seems to be doing fine. No other tomato plant survived anything. But the basil is doing well and growing fast, so I should be able to start making some pesto soon. Maybe if the tomato plant does well, I can cobble up some caprese salad, too. I’ll keep you posted. The infamous GER also called me on Monday telling me to come get some fish he’d caught. He went fishing had more than he could deal with, and I was afraid it would fill an ice chest. It was a good amount, but not too much. He says it’s “Red Drum,” but I have no idea what that is. No matter–he’d filleted it nicely, and I know it was fresh because I bit on a fish scale when I was eating some. No complaints. 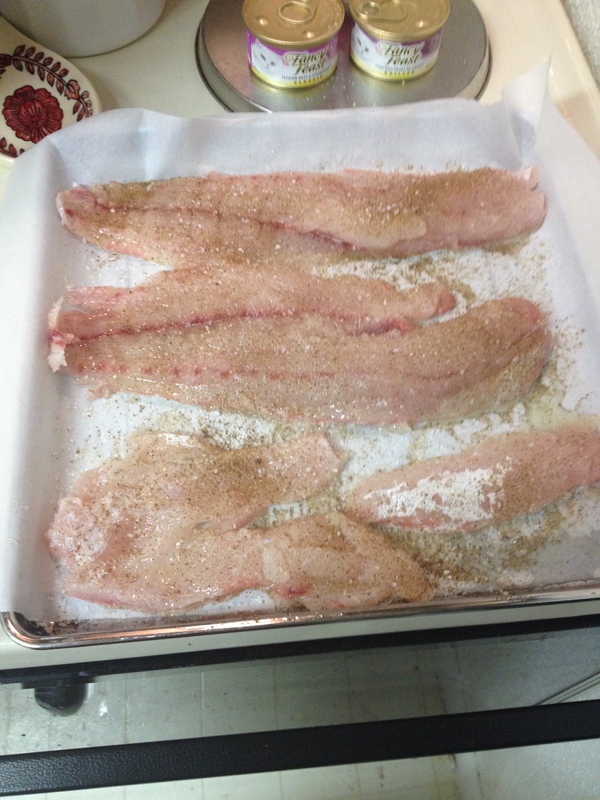 When I saw the size of these fillets, the first thought that came to mind was “River Monsters.” But a little olive oil, salt and a sprinkle of my favorite Cajun Land Creole Seasoning with Green Onions, baked for about 15 minutes (if not less) and it’s delicious. No, the cat food has nothing to do with it. Now onto the ice cream. Remember the blueberries the GER brought last week? 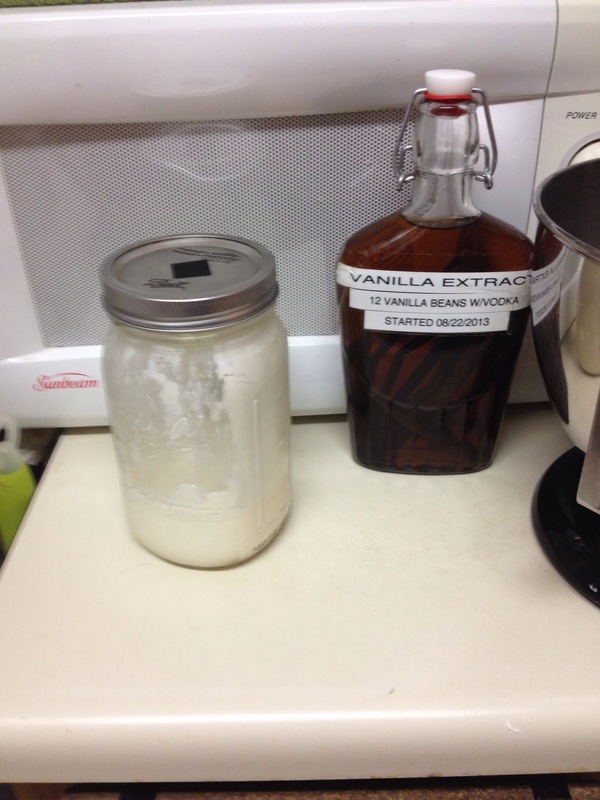 I made ice cream last Sunday! (Yes, it’s gluten free, ha, ha, ha.) 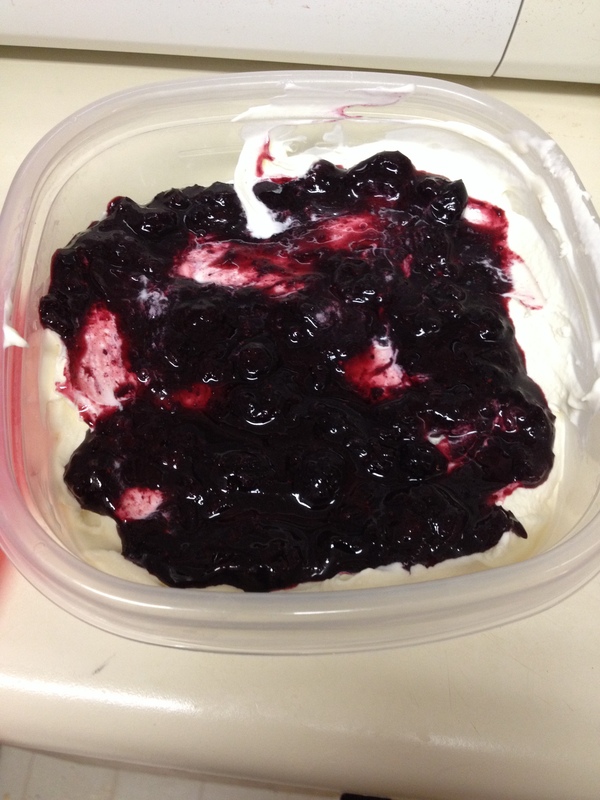 I still have some, since it only requires 1.5 cups of blueberries. 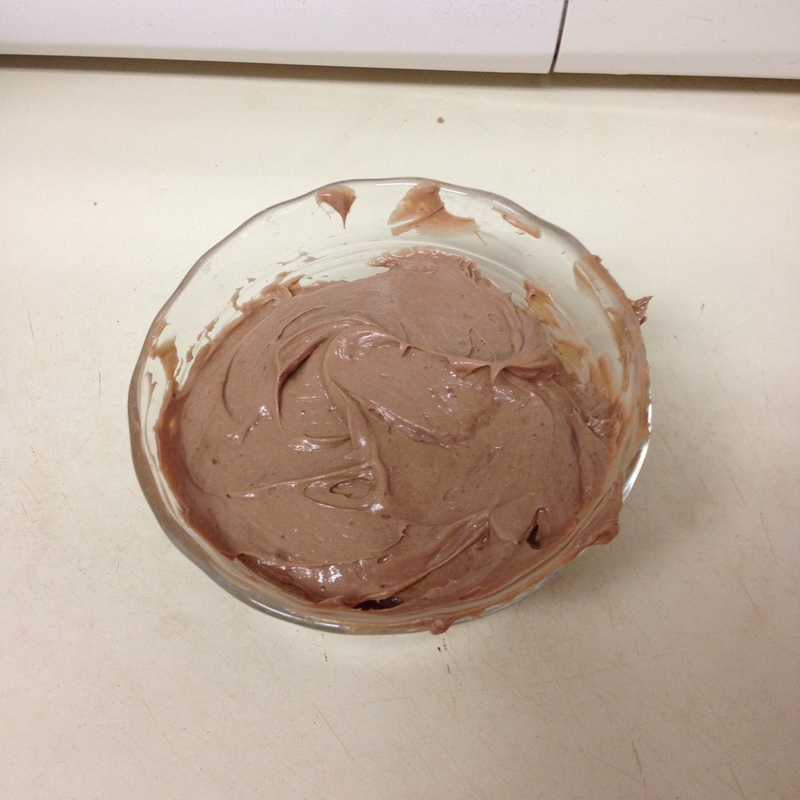 Instead of sugar, I used SomerSweet, and that’s my recommendation for sugar-free; the original recipe calls for sugar. 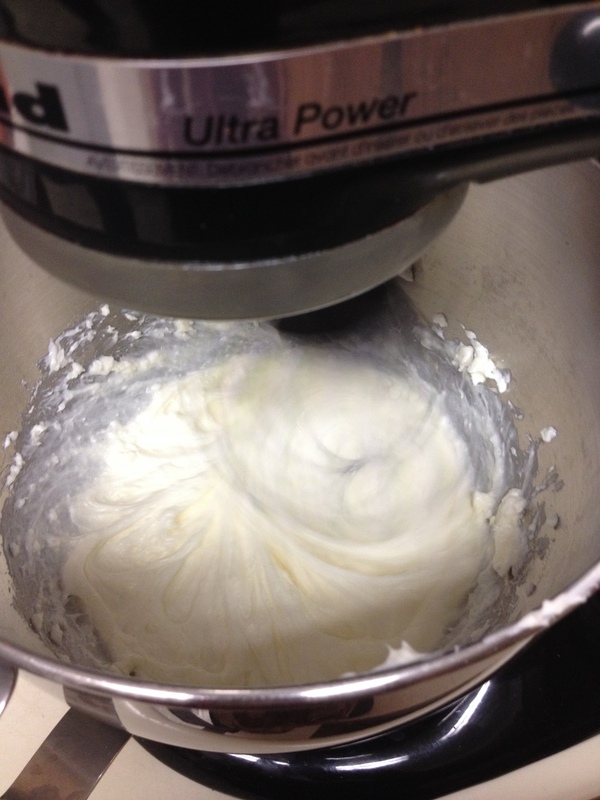 Should you decide to make this recipe, what you use to sweeten it is entirely up to you. The finished product. Yes, it’s even better than it looks. There is a story as to how I got to this point. Hop in and I’ll tell you all about it on the way. . . .
First, of course, you prep your ice cream maker. In my case, it involves freezing the big bowl thingy for 24 hours. Once that’s done, you assemble everything else. 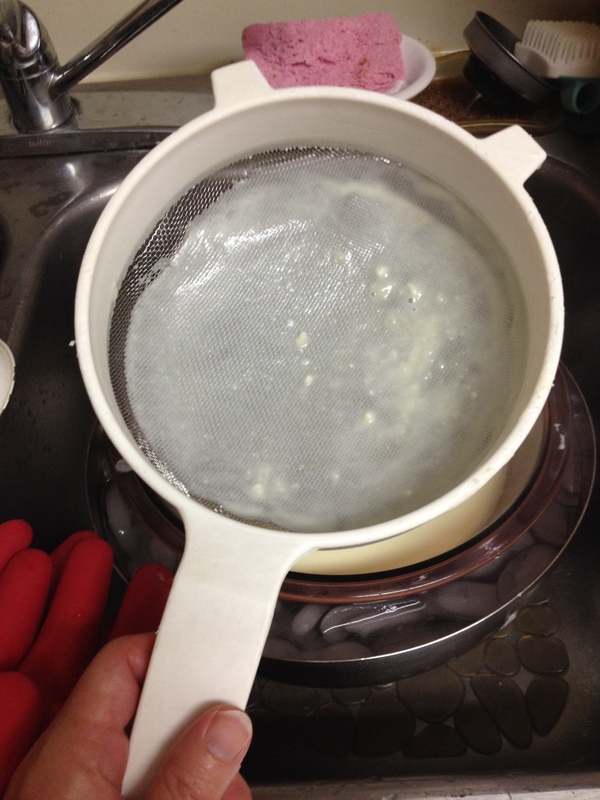 Time to heat the milk and cream–carefully, or you’ll have a huge, stinky, difficult-to-clean mess on your hands. 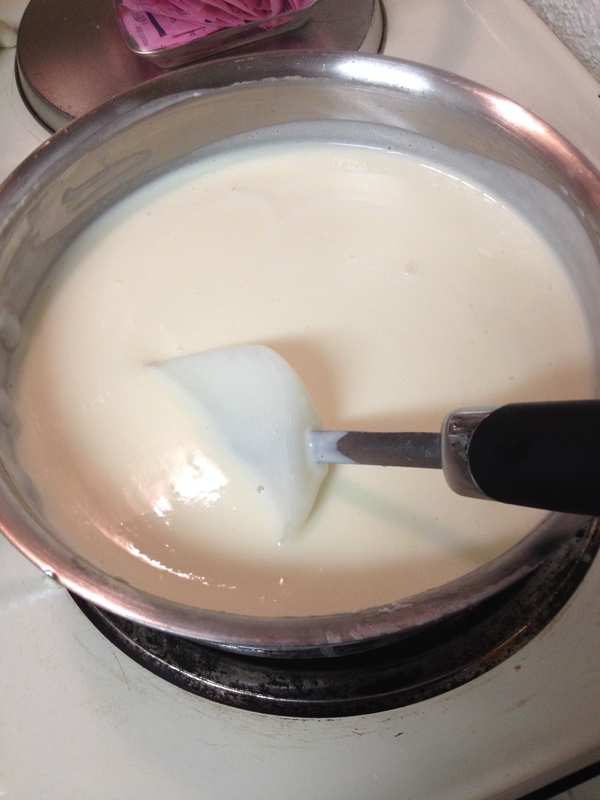 Don’t let this mixture boil–you only want it to warm up and steam, about three minutes. Straining the mixture, giving it a smoother texture. As you can see, a little bit of lumpiness remains, but not a lot. You could skip this step, but. . well, that’s up to you. 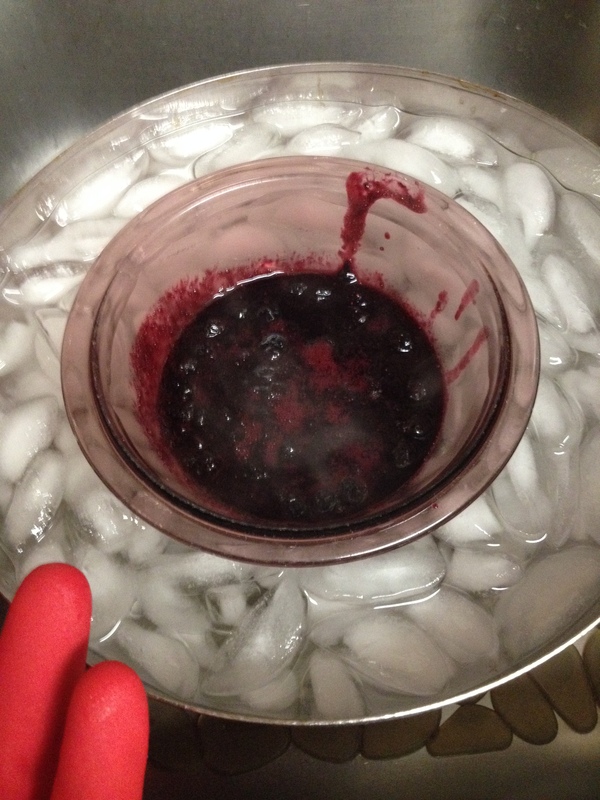 When done, let it cool in the ice bath for a bit–but don’t drop water in it on the way out. Delicious, but not yet. Gotta wait. 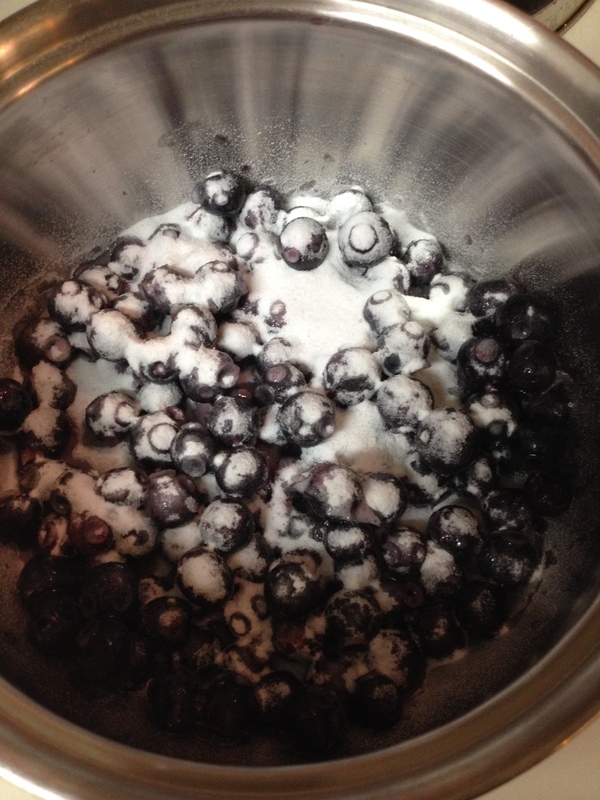 Blueberries and SomerSweet. Delicious on their own, but stay with me. Cook them up, and mash half of them up while they cook, and until the blue stuff becomes thick and syrupy. 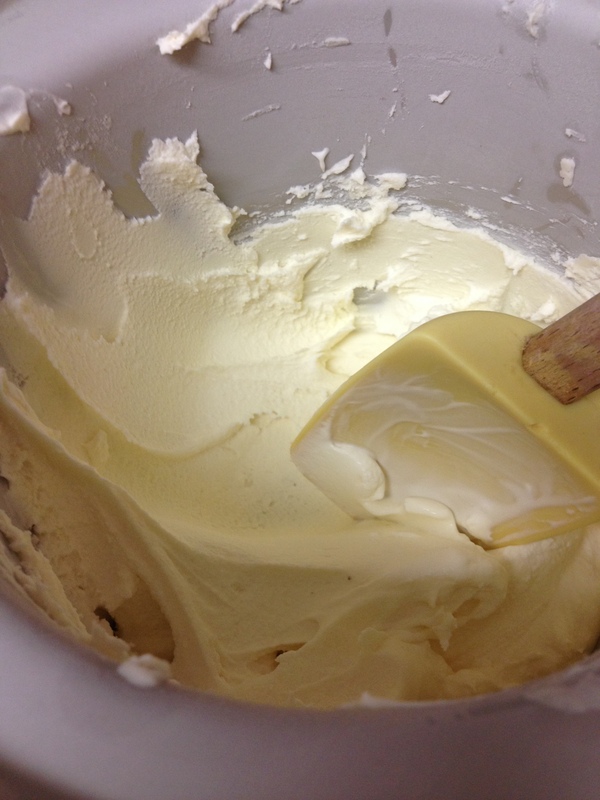 Here’s where I differ a little from the recipe–when the ice cream mixture is cooled down, and you’re ready to add it to the ice cream maker, remove the bowl from the ice water bath, dry off the bottom of the bowl, add it to the ice cream maker and turn it on. 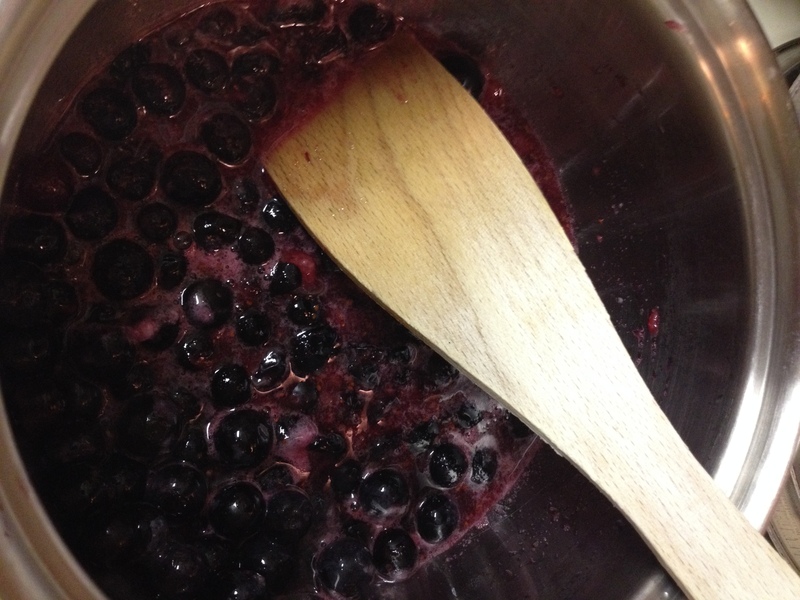 Turn your attention to the blueberries–add them into a separate bowl, put the bowl into the ice water bath, balancing it so that water doesn’t seep in, and let it cool. Chill the blueberries now, while the ice cream is freezing. At this point, you’ve got the ice cream in the ice cream maker, it’s plugged in, turned on, and doing what it does best. Ice cream in the ice cream maker, getting frozen. YUM. It’s coming together now. Are you with me? Yes, it’s very much worth the trouble. 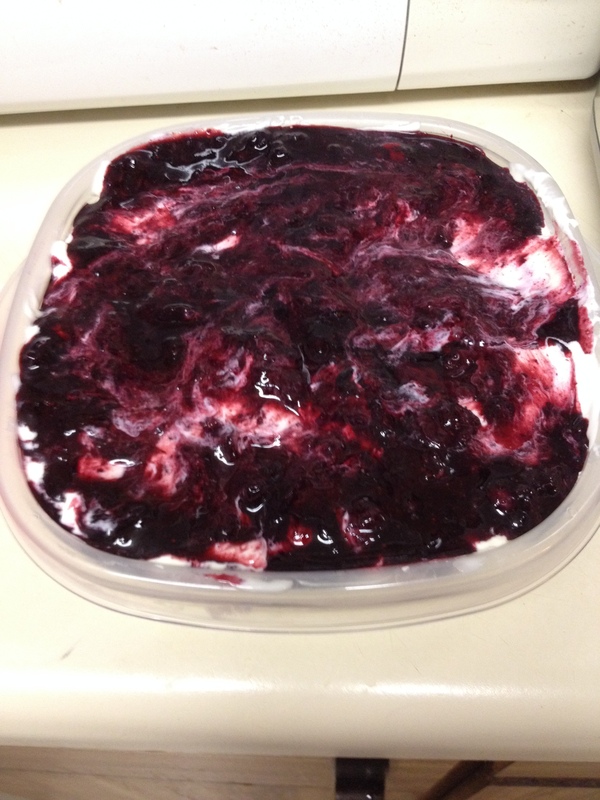 Repeat with the second half of the ice cream, and the remaining cooked blueberries. At this point you cover it and freeze it until. . .it’s hard. I put a layer of plastic wrap on top, and put the container’s top on it, then froze it. And that, Dear Readers, is how you get to this point. A lot of trouble, yes, but this ice cream is really, really, really good, and worth the trouble. I actually haven’t eaten any yet, because, well, I’m waiting for the GER to come by and have some. Unfortunately, he had a ROOT CANAL this week, so he’s not been up to doing much, poor thing. But it’s frozen, so I can wait a while, or maybe make more later. So did the remaining cream cheese. 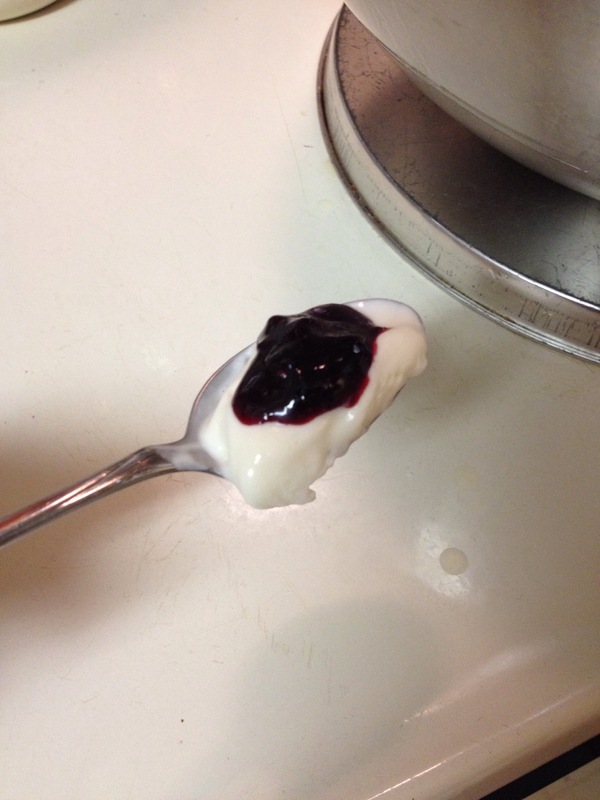 But it looks the same as the creme fraiche, so I’m not going to bother you with a picture of that one. 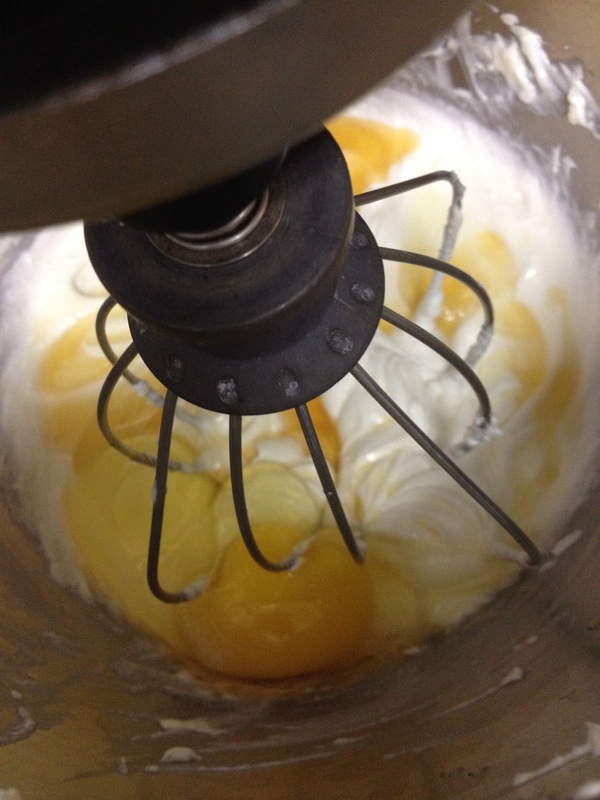 Just toss a few things together and whip up with your hand mixer. I don’t even know how many times I ran the dishwasher last weekend. 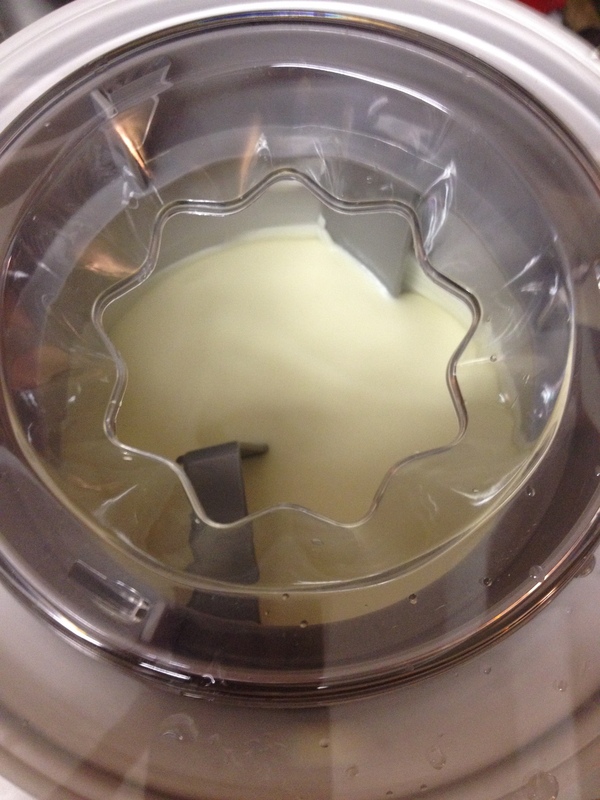 I just re-washed the ice cream maker’s insert and moved on to the next one. This is what some of us call FUN. I’ve also made, since then, Cinnamon Ice Cream and Coffee Ice Cream from my favorite book, and to use up the egg whites from the Cinnamon Ice Cream, I’ll make some grapefruit sorbet soon. 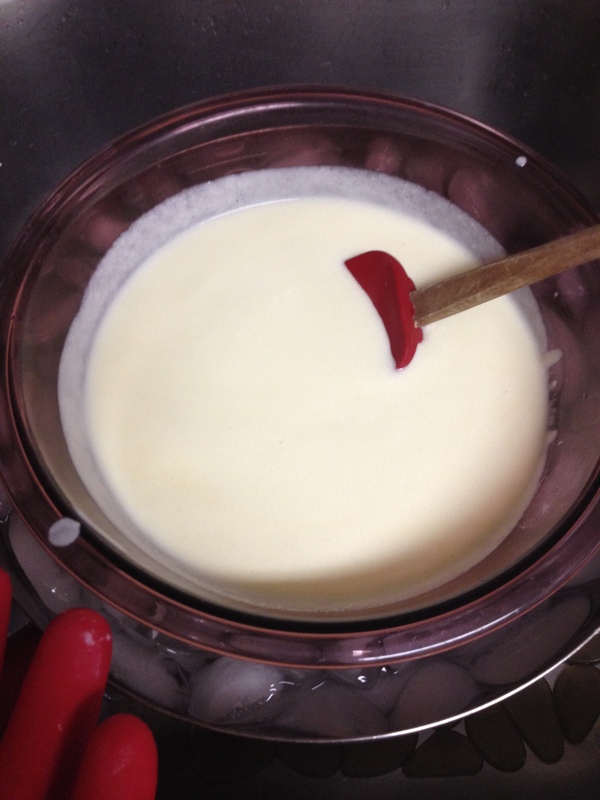 It’s that time of the year–make some ice cream!! This one is a bit more troublesome, but very delicious. Recipes abound online and in books and magazines, so find one that looks good to you and go for it. And if you have an ice cream maker–what are you waiting for?